Stewart here…and fair warning, some big SPOILERS regarding recent episodes of Agents of SHIELD and Captain America: The Winter Soldier, so in case you haven’t seen the latter and haven’t caught up on the former yet, you may want to avoid this article until later. Well, this week’s Agents of S.H.I.E.L.D.answered a lot. In case you’re one of the many people who did see Captain America 2 this weekend, you might be aware that S.H.I.E.L.D. is in serious doo-doo. Like “OMG, we’ve had Hydra agents as high-ranking S.H.I.E.L.D. agents for years” type of doo-doo. And that spilled over into Agents of S.H.I.E.L.D. last episode and this one in a big bad way. But before we get into all of this stuff, let’s talk a bit about S.H.I.E.L.D.’s big HYDRA problem. In the comics, its not the first time S.H.I.E.L.D. has fallen prey to a threat from within. But the origins of this big plotline in the Marvel filmverse have roots in the 2009 series Secret Warriors, where Nick Fury (the original white one) discovers in the very first issue, that S.H.I.E.L.D. has been under the influence of HYDRA for decades, and puts Fury on a secret offensive against HYDRA and its leader Baron Stucker (a man you may have already met if you’ve saw one of the credits teasers in Cap 2). While the filmverse Fury has gone underground and S.H.I.E.L.D.’s fate is way up in the air, it seemed likely that the TV show would have to deal with that. I’m sure the Marvel movie brain trust knew that when getting Agents of S.H.I.E.L.D. off the ground that it would fall right into the timeline of Cap 2, and had to hold back a bit on reveals in the show order to keep some surprises fresh until the movie opened. A page from Secret Warriors #1. It also explains some of the series’ issues that for most of the season critics have complained about. While its been nice to see some team-building on the show, the momentum in answering a lot of questions set up in the pilot (Coulson’s resurrection, The Clairvoyant, etc.) was slowly teased out maybe a bit longer than it should have been. On the other hand, seeing those questions get answered (although in the Clairvoyant’s case, that’s a “maybe” there) recently has managed to be helpful in reframing the series so far in a new light. Now we know Fury has always been watching Coulson, even using May to select the team, specifically picked for skills needed to put Coulson down if the need arose. 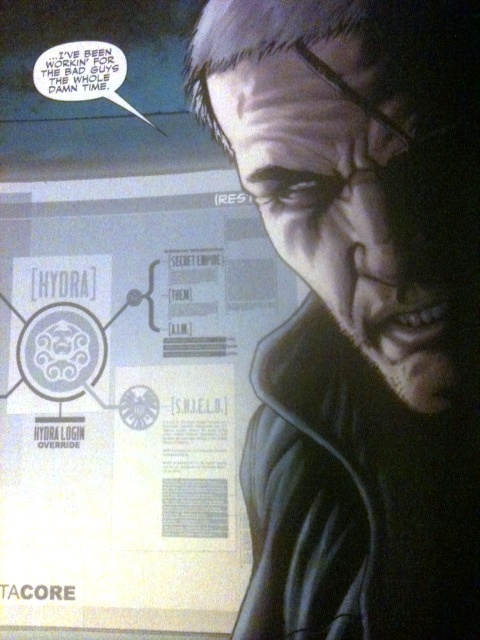 Then there’s Garrett, Coulson’s old buddy being a HYDRA agent, and maybe (?) the Clairvoyant himself. And let’s not forget all those missions for S.H.I.E.L.D. collecting dangerous trinkets that may have been all HYDRA missions in disguise. All of this would be bad enough for some serious trust issues to be worked out, but the reveal of Grant Ward being a HYDRA agent too (although I have a theory on that which I shouldn’t discuss here until I see the rest of the season) and killing Victoria Hand was icing on a crap cake for the good guys. I just recently read an interview with some of the EPs about that particular turn and in retrospect, I may have to rewatch the season just to see how well that plays. But from memory, a lot of it lines up and makes sense that Ward may be a HYDRA mole. The killing of “The Clairvoyant” last episode by him makes a lot more sense in covering HYDRA’s tracks (after all, what would happen if that man in the vegetative state somehow revealed what was going on? ), and when he insisted on traveling with Garrett to the Hub, I’d seen enough episodes of 24 to realize Mr. Ward was not all he seemed to be. So where does this leave us for the next five episodes (and next season if the show gets renewed)? Well, we’ll get to see The Fridge (along with a somewhat familiar looking gentleman in S.H.I.E.L.D. wear), and hopefully we’ll find out more about if Ward’s really evil or what. And also, probably a lot of trust exercises in-between fixing what’s left of S.H.I.E.L.D.. After all, it’s not like the show’s getting a title change to Agents of HYDRA, right? Right? ← Guest Post! 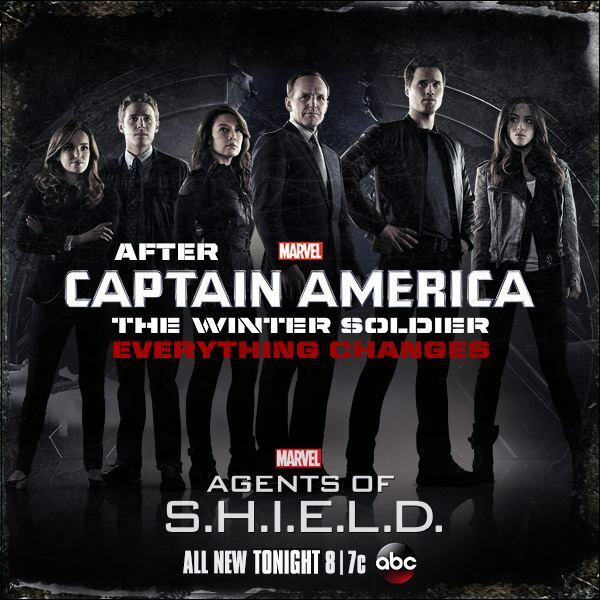 !~ Marvel Springs ahead of Summer blockbusters with Winter soldier that won’t Fall down!